Contractors took the first step in the largest-ever tunnel-machine repair Thursday, as they hefted a 270-ton piece of Bertha’s upper shell. 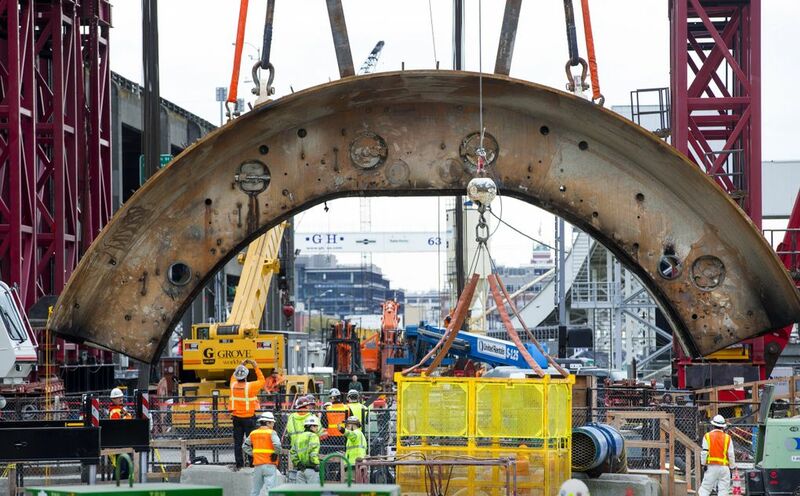 Like a rusty sunrise, an arc-shaped piece of tunnel-boring machine Bertha was lifted from its rescue vault Thursday afternoon, and set along the Seattle waterfront for repairs. Click upper right corner to enlarge. The hoist by Mammoet took 45 minutes, using a red crane 24 stories tall, which lowered the part onto a bed of coarse timbers. Workers at Seattle Tunnel Partners (STP) watched from the side, while a few escorted the load using yellow ropes. This is the first step in the largest-ever tunnel-machine repair, which is expected to last through the summer. Within a couple weeks, the contractors are expected to extract all the front-end parts from the Highway 99 tunnel machine, including the 4-million-pound cutter drive containing the damaged cutting face, bearing seals, bearing and drive axle. Chris Dixon, STP project manager, said Bertha is on track to restart digging in August. It will grind from South Main Street to the Alaskan Way Viaduct and stop again for inspections, before diving below the old highway into the deep downtown hillside. 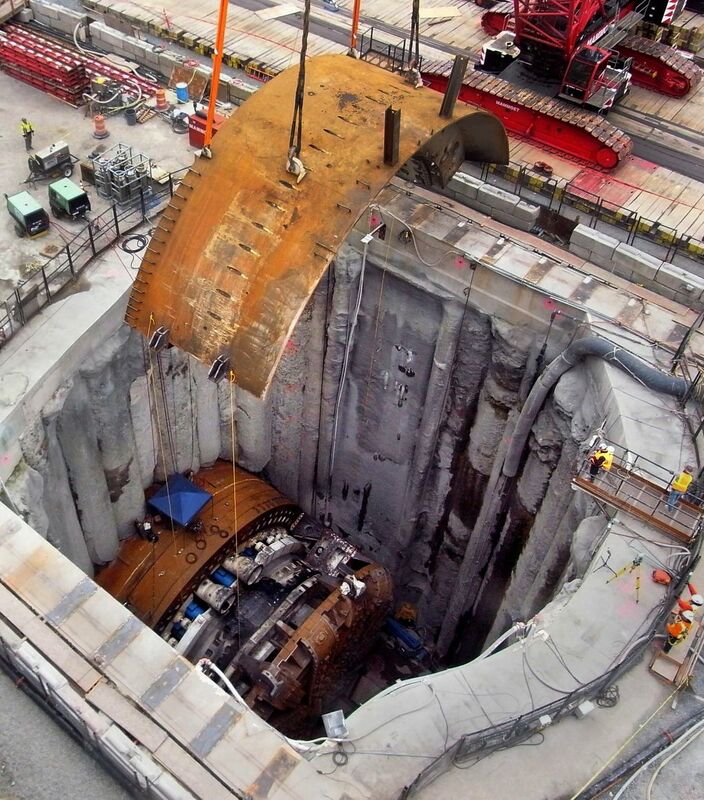 Bertha stalled in December 2013, setting the $2 billion tunnel nearly two years behind the Washington State Department of Transportation’s goal of opening the four-lane tube to traffic by this year’s end. The operation Thursday appeared to go smoothly, though it started seven hours later than expected. Crews took extra time to inspect the connections on the crane cables, They stopped midday to inspect the machine from within, to ensure that steel parts were properly disconnected. 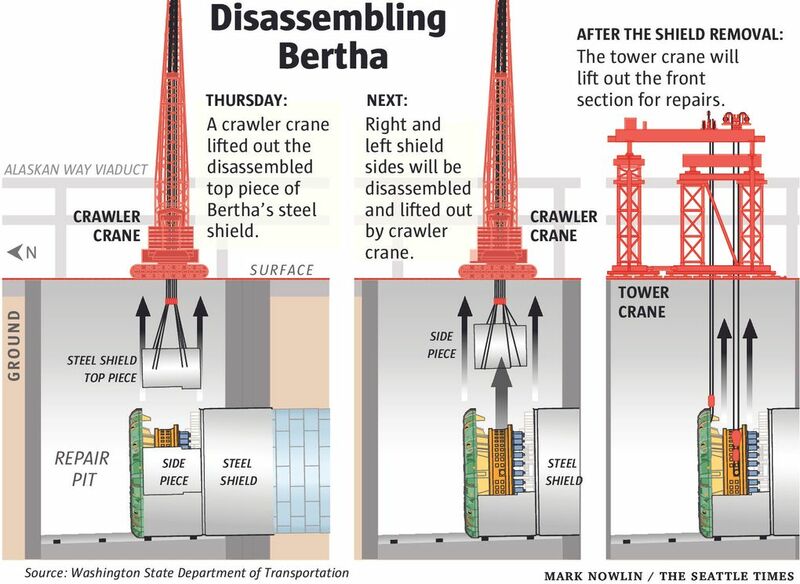 The rust, which has accumulated quickly since Bertha broke into the open-air repair vault last month, was expected and poses no structural risks, Dixon said. Simply to reach this stage of the repair effort required massive groundwater pumping from a repair access vault. Water movement was suspected of causing the soil to settle 1¼ inches beneath parts of the viaduct and Western Avenue. Even as Bertha’s shell was readied for a lift Thursday, no fewer than five surveyors were out on First Avenue monitoring ground levels. Matt Preedy, the state’s deputy Highway 99 director, said the ground is currently stable.